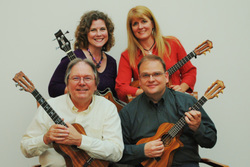 Our motto is “Come for the fun and stay for the music.” We believe music should be both of a high quality and enjoyable.Using our unassuming and friendly ukuleles, the four members of Snapback recreate classic tunes from the 60’s, 70’s, and more; all of your favorites like California Dreamin’, Blue Bayou, Please Mr. Postman, Happy Together, and Black Water (yup), just to name a few. Snapback offers expertly arranged vocals and the beloved, familiar harmonies that propelled great songs to the classic, timeless, platinum-selling status that they still are known for today. Your spirits will be instantly lifted, you won’t be able to stop smiling, and you will fall in love with the unique sound of Snapback.